If you were like millions of other kids, you suffered through crunchy pieces of cereal just to get to the marshmallows. What is it with cereal marshmallows and why are they like no other marshmallow you’ve ever encountered anywhere else? Here’s a look at six delightful marshmallow cereals! Childhood: Watching Snorks while eating Kaboom cereal. 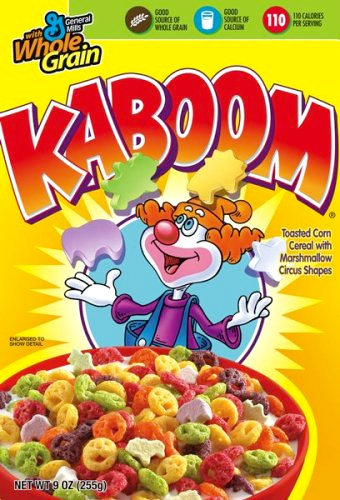 Maybe you were afraid of clowns as a kid, but I looked forward to seeing the clown on the box of Kaboom cereal. I knew it meant I was about to eating a rainbow assortment of crunchy bits interspersed with gooey marshmallowy goodness. If you ever chose a box of regular Alpha-Bits over Marshmallow Alpha-Bits, you were doing it wrong. Marshmallow Pebbles for the win! That’s right, Marshmallow Pebbles are a thing. Barney Rubble can’t wait to get his hands on a bowl of this stuff. Also, why was Barney always taking Fred’s cereal? Couldn’t he have just picked up a box of his own at the store? A marshmallow inside a marshmallow? WHAT!?!?!?! This is one of the best of the marshmallow cereals because they kept adding more pieces. Remember when red balloons with stars were added? That news was groundbreaking in elementary schools across the nation, rivaling only the headlines of new blue M&M’s. Shredder took a note from Barney Rubble about taking cereal from others. If one cereal from the past ever makes a comeback, please let it be this one! Between pieces of “ninja nets”, were scattered marshmallow bits vaguely based on props from the Turtle universe. How many years did you keep one of those TMNT bowls that came packaged with the cereal? To be fair, I still run around like this until I find a box of Count Chocula. Does it get any better than a bowl of chocolate vampires with marshmallow pieces? What’s your favorite marshmallow cereal? Tell us all about it!